Because trauma is a multisystem disease, multiple injuries may be present in the trauma patient. Other injuries often take priority over injuries to the genitourinary (GU) system and may initially interfere or postpone a complete urologic assessment. Coordinated efforts between various services caring for the patient are crucial to ensure comprehensive care, and evaluation of the injured patient with possible GU trauma should not differ from that of other trauma patients. Follow the protocols of the Advanced Trauma Life Support (ATLS) program of the American College of Surgeons to provide total patient care. [1, 2] See the images below. Avulsed left renal artery with thrombosis. The kidneys, pelvocaliceal system, and ureters comprise the upper GU tract. The adult kidneys are well protected by the rib cage and vertebral column, but lateral forces can compress them between these structures, leading to injury. Sudden deceleration can cause avulsion injuries to the renal pedicle and pelvocaliceal system. Only 6% of patients with GU trauma have ureteral injuries, probably due to its small size and mobility, and the protection provided by the psoas muscle posteriorly, the abdominal viscera anteriorly, and the vertebral column medially. From 3 to 10% of patients with multiple trauma have GU involvement; 10 to 15% of trauma patients with abdominal injuries have GU involvement. Renal injuries constitute 45% of all GU injuries; ureteral injuries constitute 6%. Mortality from upper GU tract injuries is attributed primarily to other associated injuries, and morbidity is 26%. Trauma is the leading cause of death in persons aged 1-40 years and is the third-ranked cause of mortality in all age groups. Kortbeek JB, Al Turki SA, et al. Advanced trauma life support, 8th edition, the evidence for change. J Trauma. 2008 Jun. 64 (6):1638-50. [Medline]. Grimsby GM, Voelzke B, Hotaling J, Sorensen MD, Koyle M, Jacobs MA. Demographics of pediatric renal trauma. J Urol. 2014 Nov. 192 (5):1498-502. [Medline]. Burks FN, Santucci RA. Management of iatrogenic ureteral injury. Ther Adv Urol. 2014 Jun. 6 (3):115-24. [Medline]. McGeady JB, Breyer BN. Current epidemiology of genitourinary trauma. Urol Clin North Am. 2013 Aug. 40(3):323-34. [Medline]. Zabkowski T, Skiba R, Saracyn M, Zielinski H. Analysis of Renal Trauma in Adult Patients: A 6-Year Own Experiences of Trauma Center. Urol J. 2015 Sep 4. 12 (4):2276-9. [Medline]. Baghdanian AH, Baghdanian AA, Armetta A, Babayan RK, LeBedis CA, Soto JA, et al. Utility of MDCT findings in predicting patient management outcomes in renal trauma. Emerg Radiol. 2016 Dec 21. [Medline]. Saad DF, Gow KW, Redd D, Rausbaum G, Wulkan ML. Renal artery pseudoaneurysm secondary to blunt trauma treated with microcoil embolization. J Pediatr Surg. 2005 Nov. 40(11):e65-7. [Medline]. Xu RX, Li YK, Li T, Wang SS, Yuan GZ, Zhou QF, et al. Real-time 3-dimensional contrast-enhanced ultrasound in detecting hemorrhage of blunt renal trauma. Am J Emerg Med. 2013 Oct. 31(10):1427-31. [Medline]. van der Wilden GM, Velmahos GC, Joseph DK, Jacobs L, Debusk MG, Adams CA, et al. Successful nonoperative management of the most severe blunt renal injuries: a multicenter study of the research consortium of new England centers for trauma. JAMA Surg. 2013 Oct 1. 148(10):924-31. [Medline]. Dagenais J, Leow JJ, Haider AH, et al. Contemporary Trends in the Management of Renal Trauma in the United States: A National Community Hospital Population-based Analysis. Urology. 2016 Nov. 97:98-104. [Medline]. American Association for the Surgery of Trauma. Abstracts, 49th annual session. American Association for the Surgery of Trauma. Chicago, Illinois, October 5-7, 1989. J Trauma. 1989 Jul. 29(7):1024-40. [Medline]. Buckley JC, McAninch JW. Revision of current American Association for the Surgery of Trauma Renal Injury grading system. J Trauma. 2011 Jan. 70(1):35-7. [Medline]. Chiron P, Hornez E, Boddaert G, Dusaud M, Bayoud Y, Molimard B, et al. Grade IV renal trauma management. A revision of the AAST renal injury grading scale is mandatory. Eur J Trauma Emerg Surg. 2016 Apr. 42 (2):237-41. [Medline]. Nerli RB, Metgud T, Patil S, Guntaka A, Umashankar P, Hiremath M. Severe renal injuries in children following blunt abdominal trauma: selective management and outcome. Pediatr Surg Int. 2011 Apr 24. [Medline]. [Full Text]. American College of Surgeons Committee on Trauma. Initial assessment and management. Advanced Trauma Life Support Program for Physicians. 1993. 9-46. American College of Surgeons Committee on Trauma. Pediatric trauma. Advanced Trauma Life Support Program for Physicians. 1993. 261-281. Fried FA, Rutledge R. A statewide population-based analysis of the frequency and outcome of genitourinary injury in a series of 215, 220 trauma patients. J Urol. 1995. 153:314. Gann DS. American Association for the Surgery of Trauma, 1988 annual session. J Trauma. 1989 Nov. 29(11):1459-61. [Medline]. Goldman SM, Sandler CM. Urogenital trauma: imaging upper GU trauma. Eur J Radiol. 2004 Apr. 50(1):84-95. [Medline]. McEwen DA, Alfidi RJ, Stewart BH. 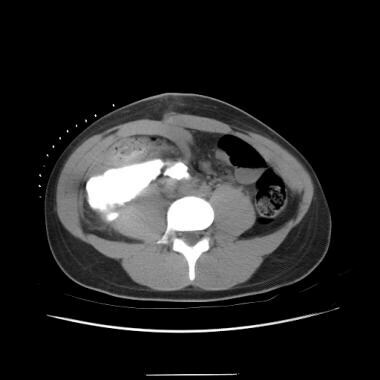 Traumatic renal sequestration with segmental hydronephrosis: report of a case. J Urol. 1971 Oct. 106(4):475-7. [Medline]. Mee SL, McAninch JW, Robinson AL, et al. Radiographic assessment of renal trauma: a 10-year prospective study of patient selection. J Urol. 1989 May. 141(5):1095-8. [Medline]. Moore EE, Shackford SR, Pachter HL, et al. Organ injury scaling: spleen, liver, and kidney. 1989 Dec. 29(12):1664-6. [Medline]. Payne SR. Upper urinary tract obstruction. Surgery. 1996. 14(12):272. Peterson NE. Current management of acute renal trauma. Urology Annual. 1991. 151-179. Rosario D, Chapple CR. Trauma to the upper urinary tract. Surgery Int. 1997. 37:113-20. Sagalowsky AI, McConnell JD, Peters PC. Renal trauma requiring surgery: an analysis of 185 cases. J Trauma. 1983 Feb. 23(2):128-31. [Medline]. Sturm JT, Perry JF Jr, Cass AS. 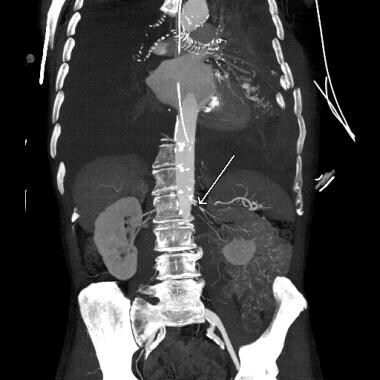 Renal artery and vein injury following blunt trauma. Ann Surg. 1975 Dec. 182(6):696-8. [Medline]. Styles RA. 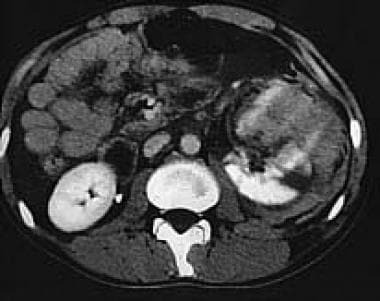 Hematuria. Surgery. 1996. 14(9):213. CT scan of abdomen and pelvis showing a urinoma. Lateral view of a urinoma. Retrograde urethrogram showing a leak in the distal right ureter with an element of obstruction.